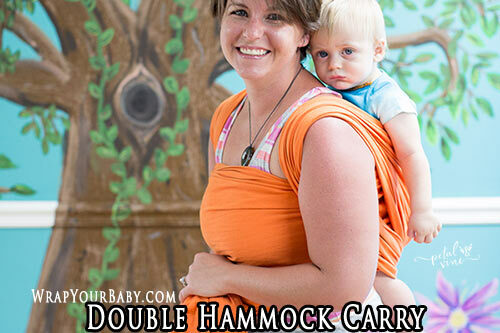 Did you know you can do a Double Hammock Tied at Shoulder (TAS), a Double Hammock Carry variation that ties at the shoulder so you have no wrap around your waist at all? Some people prefer a carry that doesn’t tie around the waist. It can be more comfortable, or more flattering. 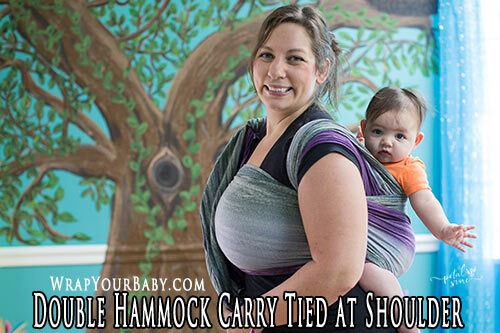 Or it might just help keep your baby or toddler higher on your back. 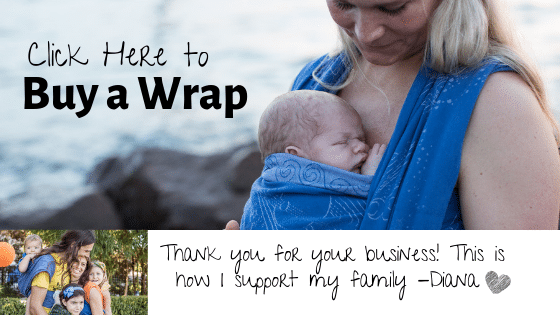 This is because the wrap that is bunched behind baby’s knees is then pulled up to the shoulder when it comes around to mom’s (or dad’s) front, instead of pulled down to tie at the waist. So that holds baby higher. Which is great for a great view for your little one. And which some people find more comfortable than a lower back carry. A standard Double Hammock Carry can, in most cases, be done with your base size (the size you need for Front Wrap Cross Carry). 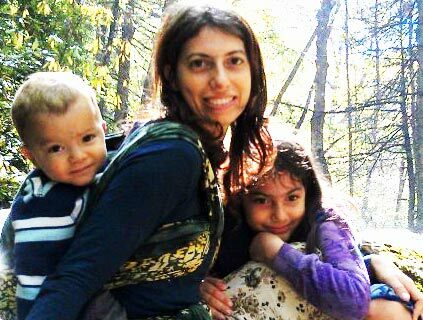 But this short Double Hammock tied at shoulder can be done with base -1 and sometimes base -2, which is to say, one or two sizes shorter than your base size. 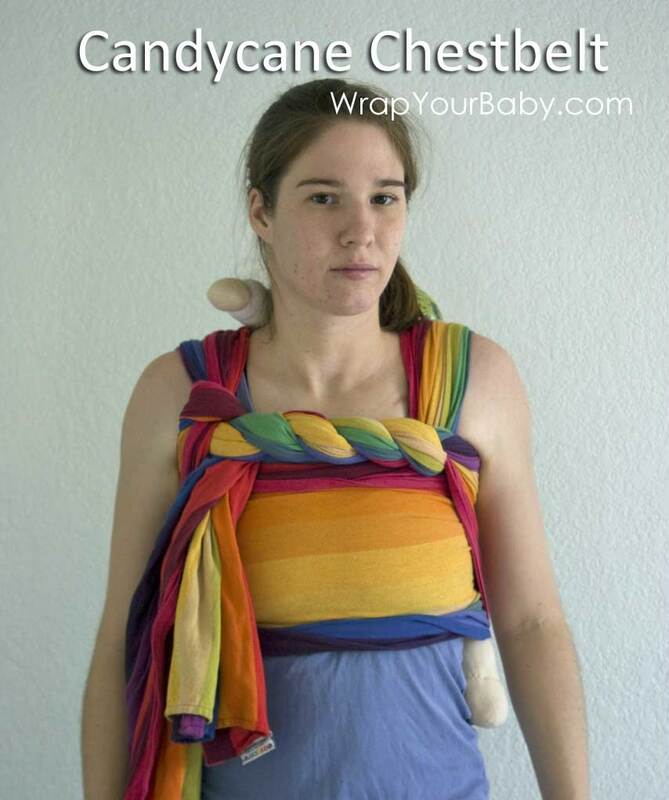 If you only have your base size wrap, it may be perfect for Double Hammock Tied at Shoulder with a Candy Cane Chestbelt (CCCB). That is what is shown in above picture. The CCCB is the twisted chestbelt going from one shoulder strap to the other. So called because it is twisted like a candy cane and with a wrap that has two different sides, can show off that contrast quite fetchingly. 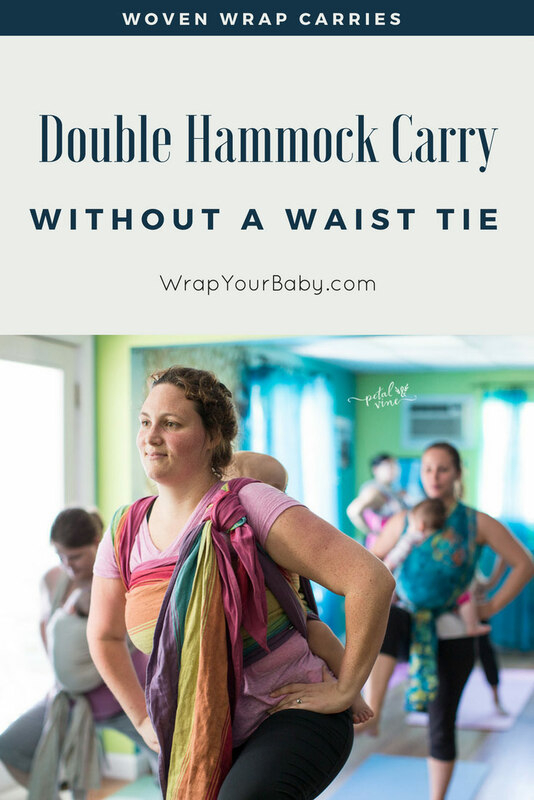 Or if you want to learn to do the full Double Hammock Carry with a full length wrap (your base size), it’s a great carry to learn that is the base of a lot of fun and versatile variations. I want to know how you like to Double Hammock. And why!